The Yiddish Theatrical Alliance -- From the "Lexicon of the Yiddish Theatre"
PERSONALITIES! ZYLBERCWEIG'S LEXICON! ACTION ON STAGE! Museum of the Yiddish Theatre! from Vol. 3 of the "Lexicon of the Yiddish Theatre"
According to Joseph Rumshinsky, even in the beginning of this century there existed a society "Di likhtike pnimer (The Bright Faces[? ])," a kind of theatrical aid organization. Membership in this society included Boris Thomashefsky, Charles Groll, Charlie Weinblatt, Isidore Edelstein, Samuel Rosenstein, George M. Cohan, Joseph Rumshinsky et al. The society had not borne any serious character and did not last long. In 1917, during a visit by Morris Morrison to the dressing room of Rudolf Schildkraut in the People's Theatre, both developed an intimate conversation of memories of their Romanian homeland. The conversation was conducted in Romanian, and many countrymen participated with them. The wardrober S. H. (Solomon -- ed.) Olivenbaum arrived quite a friendly character, who was very interested in the stage worker Moe Jacobs, and upon his question of why warmth was felt between the three participants in the conversation. Olivenbaum answered jokingly that all theatre people from Romania were cousins. Here the actor Samuel Rosenstein entered, [along] with Lazar Rosenstein and Leon Blank, and Hendrick the Wit, [and] they said that since they were all were descended from Romania, they were also cousins. This brought Olivenbaum to the idea that one would need to establish such an organization of theatre people who would call themselves "The Cousins." First row, from top, from right: Charles Cohan (Executive Secretary), Isaac Miller, David Kulok (President), Louis Goldstein, Herman Yablokoff. Second row: Irving Jacobson, Irving Grossman, Sholom Secunda, Menasha Skulnik, Louis Yaeger, Milton Weintraub, Rose Pivar. Third row: Nathan Goldberg, Louis Zauder, Morris Honig, William Rolland, Benjamin Zuger, Frank Rothenstreich, Isaac Aberman. "In the wardrobe or in the dressing room of the Yiddish theatre, [various people] used to wander in from time to time, among them behind-the-curtain workers, such as actors, dressers (ontsier), choristers, hairdressers, stagehands (bine arbeter), the saying 'cousin.' They had called one another cousin as a sign that all the employees, such as those listed above, lived side-by-side in peace and satisfaction as one family, and thus the word 'cousin' became a custom, until one day when] the dresser Olivenbaum of the National Theatre, and Sam Indin from the People's Theatre, when the first bought two boxes (shekhtlen) of sardines, and the second a box of candy (shekhtl konfektn), and as then as it was fashionable with the raffle tickets (plet-bilentn), they also had the two boxes of sardines and the box of candy raffled off, the first at the National Theatre, and the second at the People's Theatre. As it left a profit of two dollars, they had shared a treasurer (kasirer) Lazar Freed, and the sum was transferred over to him. In this connection, each who had purchased a ticket for ten cents made for a member in "The Cousins" [?] After more had been made, all of the 'cousins' had to sign, under a fine [penalty] of one cent, to call each member (mitglid) by the name 'cousin.' On 12 October 1917 in Beethoven Hall, [there was held] the inaugural meeting of the organization that had received the name 'Hebrew Theatrical Cousins.'" In a souvenir journal issued on 22 January 1929, it was said about the founders' meeting that there came the following twenty-eight: Jean Greenfield, Sam Kestin, Sam Rosenstein, Kalman Juvelier, William Schwartz, Peter Graf, Ike Schultz, Aaron Zouder, Shlomo (Samuel) Manne, Dave Groll, Sam Greenberg, William Epstein, Avraham Fishkind, William Pasternak, Max Zager, Joseph Brody, Jacob Wexler, Harry Cooper, Frank Rothenstreich, Moe Jacobs, Lazar Freed, Lazer Tsukerman, Julius Nathanson, M. Samuiloff, Philip Jacobs, Sam Indin, S. Olivenbaum, A. Ferkauf and M. Mench. All of the offices for the first six months were divided up [as such]: Sam Rosenstreich -- President, Sam Kestin -- Vice-President, Harry Cooper -- Provisional Secretary, Lazar Freed -- Financial Secretary, Sam Indin -- Protocol Secretary, Kalman Juvelier -- Treasurer, and Tsukerman, Graf and Olivenbaum -- Trustees (Namnim). It was decided that for ten cents each theatre person could, with a good character, become a member and the membership fee should be a dollar per year. Mutual assistance and a home for the elderly. To unite all workers who make a life in the Yiddish theatre, indiscriminate of age, union man or non-union man, if one is morally pure and not a strike-breaker. To support with money and other possible assistance in hardship or in illness. In case of illness, old or unable to work, get the member to a home, and for others find a means of existence. Provide free for the member with ground [krke] and a suitable companion. 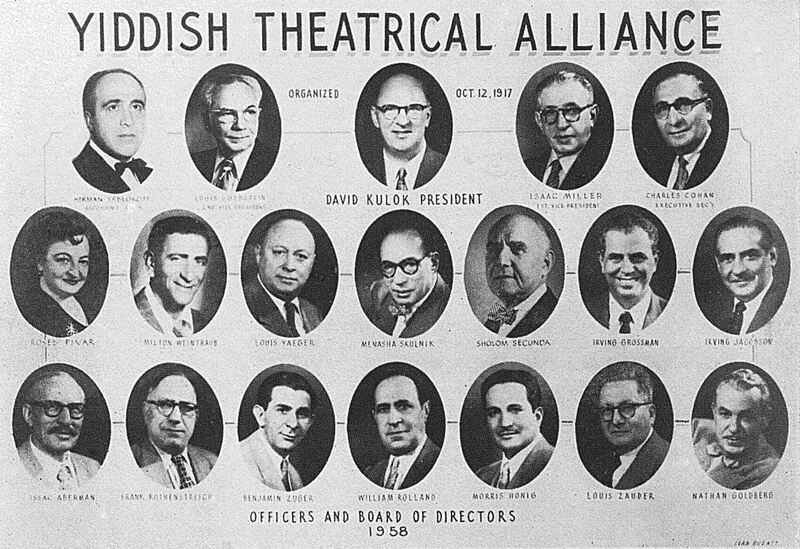 Several years later the name of the organization was changed to the "Yiddish Theatrical Alliance". The new officers were: Reuben Weissman -- President; Samuel Rosenstreich -- Vice-President; Lazar Freed -- Financial Secretary; Sam Indin -- Protocol Secretary, and Kalman Juvelier, who for many years was Treasurer. The organization bought land for 10,000 dollars in Mount Hebron Cemetery (Flushing, Queens, New York -- ed. ), which was founded thanks to the assistance of Sigmund Schwartz, and the purchase became [fully] disbursed in the span of two years. Over the years the prestige of the organization developed, and one of her first large social functions [they held] was a banquet, together with the Yiddish Actors Union, honoring the president Reuben Weissman, who had been Honorary President for many years . "The active management of the Alliance was taken over by other officers. It is over this leadership [that] came a certain chaos in the organization. The leaders were minimally observed [doing] the organizational work. ...the members had for months long neglected to pay their dues. ... It was already seldom that such daring happened, and when such a meeting took place, [there] were only a few members, faithful members [who] came. The Alliance had completely fallen apart. Several tens of true members remained on guard ... They bravely took to the work. ...With new energy and excitement they had they put together again the semi-expired organization back on its feet. Without the head of the launched organization stood the intolerable [umdermidlekher] Abe Sincoff. ...He became president and [dedicated] his entire free time to the revival of the Alliance. He increased it with a great number of new members, and he expanded the aid that was given to those who needed it. Year in and year out Sincoff remained as president of the Alliance. ...Within the years in which he lived, he gave away his activity for the Alliance, [and] he brought back the organization to a high level. ...Sincoff, in the last years of his life, made an alliance for his life's work. With his activity, and with his friendly nature, he aroused a number of the best and good-hearted doctors, who had for the members of the Alliance given their medical assistance entirely for free. The doctors were declared to be honorary members of the Alliance." "...He became the powerful force, the president, the officers, the correspondent, the collector, the package carrier, the speaker, provided the members with matzos and wine on Passover, brought by himself the hospital to the doctors." Ten thousand dollars was doled out as assistance to the members. Deceased members passed away with great dignity, and[they] were brought to their eternal rest in the cemetery, which together with the fence today has appreciated to seventy-five thousand dollars. After Abe Sincoff's death, the management of the organization was taken over by Charles Cohan, who had been for many years the Executive Secretary of the organization, doing a world of work. In the collected writings of the organization that were issued in 1949 under the editing of Mark Schweid for its thirtieth-year anniversary, it is noted that its membership consists of actors, musicians, dramaturges, choristers, composers, treasurers, managers, publicity agents, stage technicians, ushers, doormen, dressers, wardrobe people and hairdressers. "...In the most largest and smallest organizations it is established that a member should be helped with a certain sum [of money], or until a certain time, when the brotherly assistance would automatically stop. Not that way with the Alliance. It is not accepted that there is any kind of specific amount for a needy person. It is never [the case] that with so many, one cannot help. ...As long as the illness or need and suffering exists, there should be assistance, as long as the help can be given. ... The Alliance property [has] also an endowment fund, which is expected in cases of death. When a member leaves this world ... the Alliance then pays out from the fund a certain sum to the heirs." "The current modern and 'streamlined Alliance' actually became reorganized by Jean Greenfield, my predecessor as chairman. Under my administration we highly expanded the scope of our great humane work among the needy and sick members of the Yiddish theatrical profession. ...The members of our large and honorable family are becoming older, and the demands for assistance are ever more frequent and greater. ...We have a staff (the first initiative of this view belongs to the head of the doctors' staff, Dr. Elihu Katz ע"ה, for twenty-five years' time) of twenty-six surgeons, doctors and dentists, who in 1958 alone were behind 921 visits. We also especially have provided the sick and needy members with hospitals, convalescent homes [places to relax] and nursing homes. ...We have our own cemetery grounds (bis oylem) in Mount Hebron, which each year is visited by the admirers of the deceased stars of Yiddish theatre." The admission charge nowadays is fifteen dollars, and the yearly membership fee is twenty dollars. The needed funds for the Alliance were created through personal, larger contributions by friends of Yiddish actors, and also through large sums, thanks to the annual, large benefit productions, without any expense to all the participants. The number of members is 270. Sh. E. from Sam Indin and Charles Cohan. "Souvenir Journal of the Yiddish Theatrical Alliance", New York, 22 January 1929 (One page of the history in Yiddish, one page of photography of the officers in 1929, eight pages of advertisements in English, and twenty-two in Yiddish). [--] -- Yiddish Theatrical Alliance, "Forward", N. Y., 25 October 1930. B. Levitin -- Men shtupt zikh tsu koyfen tikets tsu an unternemung in a idishen teater, "Forward", N. Y., 19 January 1940. Zalmen Zylbercweig -- "Theatre Mosaic", N. Y., 1941, pp. 29-34. Dr. N. Swerdlin -- Draytig yor helfen zey kranke idishe artisten, "Tog", N. Y., 8 March 1949. Herman Quinns [Chaim Ehrenreich] -- Idishe teater velt iz gegangen oyf kvr abus fun idishe teater-menshen, "Forward", N. Y, 15 September 1955. David Kulok -- 42 yor fun dinst far'n idishen aktior, "Daily Morning Journal", N. Y., 4 December 1958.
which appears in Zalmen Zylbercweig's "Lexicon of the Yiddish Theatre," Volume 3. page 2269, 1959, New York.